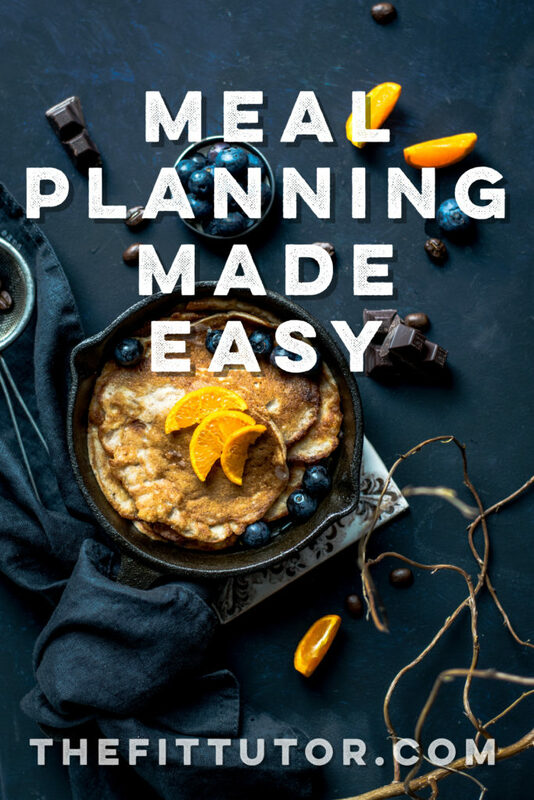 Meal Planning is Easy with this App - Try it Free Today! If you struggle with meal planning, you’re not alone. As a Nutrition Coach, my inability to meal plan has always been a mark on my honor. For some reason, planning out menus and making grocery lists tends to hurt my brain. 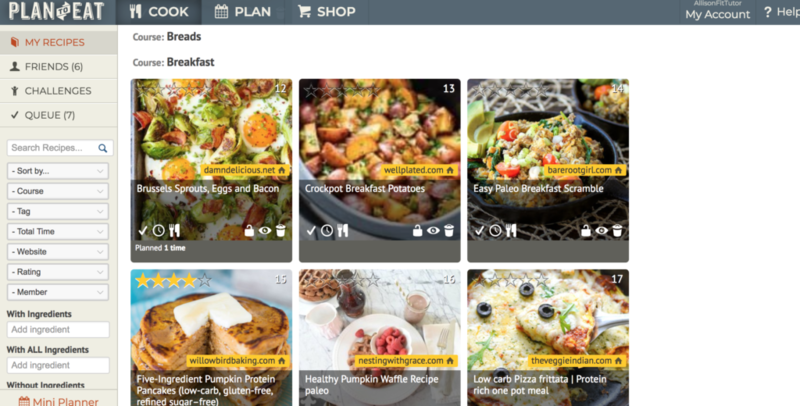 Thankfully, I discovered this meal planning app and website, and it’s been easy ever since! I’ve tried meal planning services where they plan meals for you and send you grocery lists for the week. I’m happy to pay someone else to do that dirty work for me, but they don’t know what I like. We’re not too picky, but I have yet to find a pre-made meal plan where I liked all the recipes. With this app, I get to upload my favorite recipes, arrange them on my calendar as needed, and it will create a grocery list for me! *Affiliate links included at no extra charge to you. Thanks for supporting my small business! It’s called Plan to Eat. You may have heard of it, but if you haven’t tried it yet you can free for 30 days! It’s worth a shot, especially if you have trouble like I used to. They have a website and an app, and I think both are easy to use. You save your favorite recipes to your account and then you can drag or select them to add to your weekly menu. The “Shop” section will curate a grocery list for you. 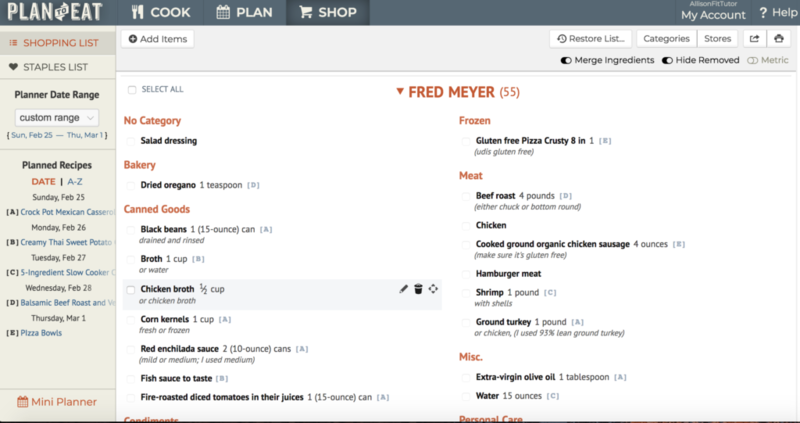 I love that you can easily create a month’s worth of menus and grocery lists within a few minutes! Before you can do any of what I’m about to explain, you’ll need to sign up for a free trial. But I’ll describe it as clearly as I can so you can see if you’re intrigued and ready to give it a try! Saving your recipes is a breeze. You’ll be lead to install an “Add to PTE” extension on your browser and it will save the recipe, instructions, and ingredient lists with just a click! Sometimes when the hubs and I are re-watching Parks and Rec on Netflix, I open up Pinterest and save my favorite recipes into Plan to Eat for easy meal planning later. It allows to double check the recipe or select a category (like soups, appetizers, etc) and then click “Save Recipe” and voila! 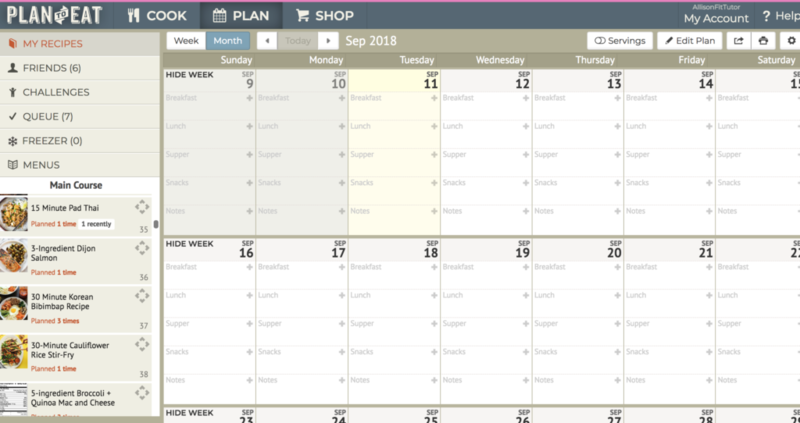 Once you have some recipes saved, head over to the “Plan” section and click on a recipe to drag it onto your calendar. On your phone (the app) you can select the calendar icon, pick a specific day, and then choose a recipe to add. You can also select what meal it’s for, like breakfast, lunch, or dinner. You can add recipes to each meal of the day plus snacks so you’re always fully prepared! Do this for as many meals and days as you’d like. When you’re happy, proud, and drooling over what’s to come, check out the “Shop” section, which is the grocery cart icon on the app, to see your grocery list. It’s easy to add extra ingredients to your list, or things like snacks, TP, etc that you need at the store but aren’t included in a recipe! You can enter them on the calendar in the “Plan” section or add them directly to the shopping list. There’s even a section for “staples” where you can click on an item you need at the store to add to the list like coffee, trash bags, etc. This is suuuuper easy on the app, but on the website don’t forget to click “copy to shopping list” before you move on! Now that you have your shopping list, you can check it over and cross off anything you already have that’s usually included in recipes, like cooking oils or salt and pepper. You can print it off or have it on your phone at the store to get that satisfaction of checking things off the list as you go! When we become “friends” we can exchange recipes and even menus! See my healthy (and some not-so-healthy) recipes and use any you’d like by clicking the little checkmark on the recipe photo to add it to your queue! I prefer to use this curated list to build my online shopping list for my local grocery store. This helps me make sure I get each and every ingredient while cutting down on impulse buys. An online shopping perk is that you can also check the price of your ingredients and make some swaps if needed. By uploading healthy-but-budget-friendly recipes, or things like 3 or 5 ingredient meals, it can naturally keep your grocery bills down. Online shopping keeps me in check, although I’m also a big fan of Trader Joe’s or Aldi to cut costs! The best thing is it’s so affordable. It’s only $4.95/mo or $39 yearly! If you choose the yearly option, it works out to 75 cents per week. So worth it to keep you from eating out too often, eating unhealthily, and make meal planning easy-peasy. You can sign up for a 30 day free trial to see if it’s for you. I’ve been using this for a year and a half now and plan to stick with it! It’s the only thing I’ve been consistent with (well, besides Sunbasket!) and has saved us money and kept us organized! Let me know if you have any questions, and I’d love to hear if you try it! Use this link for your free trial, find me on there, and don’t forget to use my healthy recipes pinterest board to add to your Plan to Eat! Thanks for stopping by, friends. Let me know if I can help you achieve any of your health and fitness goals with online workouts or accountability!